Biomass is a key resource for meeting the energy and material demands of mankind in the future. As a result, businesses and technologies are developing around biomass processing and its applications. 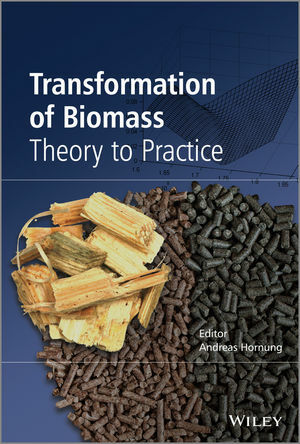 Transformation of Biomass: Theory to Practice explores the modern applications of biomass and bio-based residues for the generation of energy, heat and chemical products. The first chapter presents readers with a broad overview of biomass and its composition, conversion routes and products. The following chapters deal with specific technologies, including anaerobic digestion, pyrolysis and gasification, as well as hydrothermal and supercritical conversion. Each chapter details current practises, recent developments, business case models and comprehensive analysis of the problems associated with each approach, and how to optimize them. This textbook will provide students, researchers and industry professionals with a practical and accessible guide to the essential skills required to advance in the field of bioenergy. Professor Andreas Hornung is Head of theChemical Engineering and Applied Chemistry Group at Aston University, Head of the European Bioenergy Research Institute (EBRI) and Director of EBRI UK Ltd. Professor Hornung studied as an engineer in Chemistry at the Technical University in Darmstadt, Germany followed by a PhD of the Technical University of Kaiserslautern, Germany. After having spent another four years at the Technical University of Karlsruhe he moved into industry, developing the prototypes for his research. He worked in Austria and Italy and in 2001 took on the position as head of the pyrolysis/gas treatment division at the Forschungszentrum Karlsruhe in Germany. In 2007 he moved to Aston University, UK. Professor Hornung's group researches advanced pyrolysis/gasification and pyrolysis/combustion systems for combined heat and power production. The European Bioenergy Research Institute is based at Aston University, and is a unique platform for the development and implementation of bioenergy systems in local, national and European contexts as well as reaching for International community.